La Latina Book Club se a comprometido a presentar una reseña de libro en Español todos los Viernes. Hoy nos alegra que podemos regalar tres copias de nuestro libro a tres "fans" de La Diva de la Banda, Jenni Rivera. // The Latina Book Club is committed to doing a Spanish-language book review every Friday. And this week, we are happy to give away three copies of our book to three fans of Jenni Rivera. NOTA: El concurso solo esta abierto a fans en los Estados Unidos. Buena Suerte. // NOTE: Contest only open to fans living in the continental U.S. Good luck. RESEŇA: Jenni Rivera era una cantante y actriz con mas de 15 millones discos en total y millones de fans al rededor del mundo. Cuando Jenni murio de un accidente de avión el 9 de diciembre de 2012, el mundo perdió a una artista cuyos talentos fueron más allá de fronteras y aún idiomas. Jenni logró 15 discos de platino y 5 discos de doble platino. Popular tanto en los Estados Unidos como en México, ella fue nominada para un récord de 11 premios de Billboard en 2009. JENNI RIVERA: LA DIVA DE LA BANDA es un tributo fotográfico a esta artista querida que presenta imágenes únicas de una estrella que se iluminaba tanto la escena musical como la gran pantalla. Con casi 100 fotografías a todo color, este libro permite que los admiradores vislumbren la vida de esta estrella—desde su debut comercial a finales de los años 90 hasta su ascensión a la cima de las listas de éxitos de Billboard en la primera década del siglo XXI. Este recuerdo también explora los talentos diversos de Rivera como empresaria y actriz de televisión. 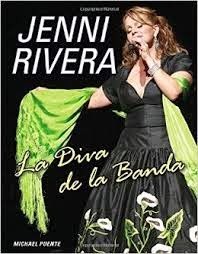 Para aprender mas sobre nuestra diva, visiten www.jenniriveramusic.com. EL AUTOR: Michael Puente tiene 20 años de experiencia. El trabaja como reportero para WBEZ 91.5 FM y vive en Chicago. CONCURSO: Tenemos tres copies del libro. Para ganar una copia, dejen un comentario abajo o dejen un Tweet con nuestro hashtag #amreadingwiththelatinabookclub. Buena suerte. SUMMARY: This is a great photo keepsake about an amazing singer and actress who sold more than 15 million albums and had fans worldwide. Jenni Rivera died on December 9, 2012, and the world lost an artist whose talents transcended borders and even languages. One of this generation’s most beloved singers, Jenni had 15 platinum and 5 double platinum records. She was popular in both the United States and Mexico, and played to sold-out crowds across North America, and in 2009, she was nominated for a record 11 Billboard Awards. JENNI RIVERA: THE DIVA OF BANDA MUSIC is a photographic tribute to this beloved artist, featuring unique images of a star who lit up both the stage and the screen. Featuring nearly 100 full-color photographs, this book provides fans with a glimpse into this star’s life—from her commercial debut in the late 1990s to her ascent to the top of the Billboard charts in the 2000s. This keepsake also explores Rivera’s wide-ranging talents as an entrepreneur and a television actress. To learn more about this extraordinary actress, visit www.jenniriveramusic.com. ABOUT THE AUTHOR: Michael Puente is an award-winning journalist with more than 20 years of experience. He is currently a reporter for Chicago Public Media, WBEZ 91.5 FM and was named best reporter by the Indiana Associated Press Broadcasters Association in 2008. He lives in Chicago.